Today it rained most of the day. That, I suppose, is part of the joy of a British summer. The rainy weather conditions coupled with a rare non-work day allowed me to work on a couple of slightly silly websites that were rather fun to make and helped bring good cheer to my day. At work yesterday I happened to be looking for some domain names and I noticed the .website TLD existed. It seems like anything can be a TLD these days, I thought to myself. And then I thought about the glory days of the early internet back in the 1990s. After that it was inevitable that I would end up with another silly domain name — nineties.website. Last night I hacked together a single HTML3.2 page for the site, which I finished off today. What I realized was how much fun writing plain HTML actually is. Rather than thinking at the level of a whole site or caring very much about structure I could just type away whatever nonsense popped into my head. It was quite liberating. Naturally, as part of my commitment to authenticity I used tables for layout. And that was not so much fun. No worse, I suppose than doing responsive layouts with Twitter Bootstrap, which is essentially the same thing but using CSS and divs. What I hope might happen is that nineties.website becomes a kind of shrine to the folk art of the 90s. I know that my colleague Pete is already working on an HTML5 high-tech 90s-style web page. 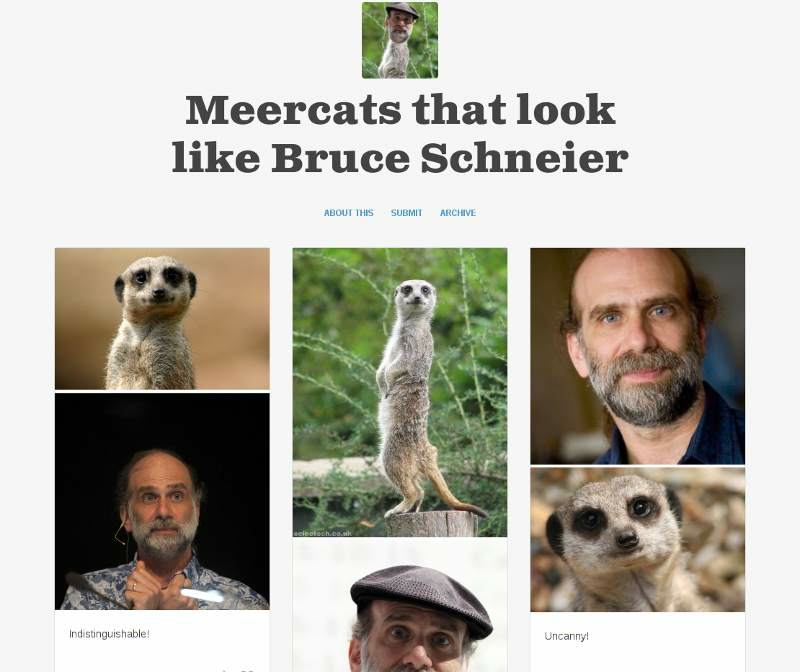 This was just a silly thought that I had the other day and turned into a tumblr — Meerkats that look like Bruce Schneier. You can probably guess that this was very much inspired by Otters Who Look Like Benedict Cumberbatch: A Visual Examination.In case you don’t know who Bruce is, he wrote a seminal book on crypto and is an expert on privacy and security. He blogs over on schneier.com. You should read his stuff!